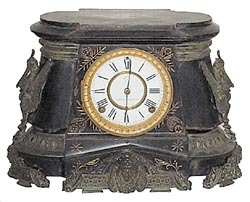 Ansonia Clock Co. enameled iron case, "Pompeii", ca 1904. The case has etched designs that are gold filled. The black iron case is dirty and wearing, should be repainted. It would appear the attached ornaments were originally finished in black. The case is 15 inches wide, 10 3/4 inches high. This clock has an 8 day movement, striking a gong on half hours, and running. Good 2 piece porcelain dial is signed by Ansonia, nice beveled glass, French sash and has the correct pendulum. The ornaments are pretty exotic, mythical birds, ladies heads. Ly-Ansonia No.968.